Small amount of toy filling or wadding. 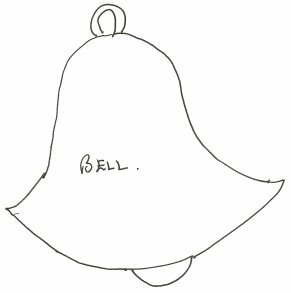 Download: Felt Bell Xmas Pattern. Print off the pattern and cut out all the shapes. Using some sewing pins, pin the paper pattern to your piece of felt and cut out the shape. Using the needle and thread sew a blanket stitch around the edges leaving 1-2 inches at the top so you can fill it. Do not remove the thread as you will use it to finish off. Fill the ornament with a small amount of toy filling and then sew in the ribbon for hanging it up. Close up the top with the remaining thread in the same blanket stitch style.